Are you frustrated with your marketing activities? Do any of these sound familiar? Your marketing’s ad-hoc. You assess each opportunity when it comes up, but you don’t have an overall budget or plan. You’ve tried a few different marketing approaches, but you don’t know which activities drive the most business. You know who your target customers are, but you don’t know how to reach them. You know your offering’s good, but you always end up negotiating on price to get the sale. The amount of business you have varies wildly from month to month, so your revenue varies as well and it’s hard to plan for great delivery. If so, it’s time to take a step back from the day-to-day and look at your marketing as a whole. 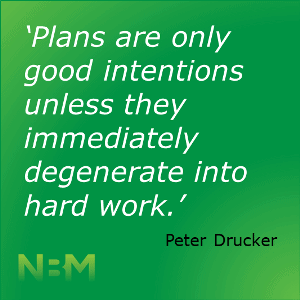 Time to create a marketing plan, focused on your business, your market, your customers. So that all your marketing activities work together to reinforce each other and deliver results. We bring fresh eyes and marketing expertise. You bring passion, commitment and a deep knowledge of your business. We start with a deep-dive workshop. It’ll take half a day, for you and key members of your team. We ask lots of questions. About your business. Your competition. Your clients. Your marketing history. Your budget. Then you get a break. We carry on working. We look at your online options – your website, social media, SEO, Google Ads. We look at your offline options – trade shows, direct mail, loyalty and referral, telemarketing. We look at your resources – not just your budget, but how much time you have and what skills you have. We put all that in the pot and cook it up into a practical, calendarised plan. Month by month activities to help you build your marketing strategically over time. In many cases, there’s someone in your team who can do a lot of the day-to-day work. An office manager, admin support, PA or VA. But they may need help. Setting up a blog or newsletter. Spam Act compliance. Writing clear, interesting copy. Optimising images for the web. Managing social media. Briefing and managing designers, printers and other suppliers. You may also need some bigger projects to make your marketing work, like cleaning a database, implementing a CRM, revamping a website or preparing for a trade show. Our marketing partnerships include regular meetings, every week or twice a month depending on your needs. Plus pretty much unlimited phone and email support between meetings. NoBull Marketing Partnership plans start from $5000. Better yet, your first meeting’s absolutely free. So why not book a meeting and find out whether you’d like to work with us.